Or comments on your blog / website that have these huge links that will screw up your website layout? Set an example and use any of the services listed below that will make the URL short to re-direct someone to the correct website with the long URL. All short URL's lead to the main page. A parody website to all of the above services. Create URL's that are huge. Because bigger is better, right? 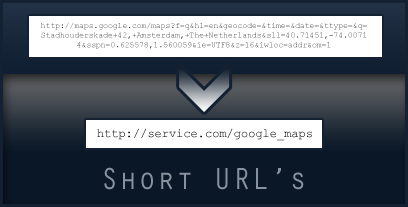 Use NickNark to uncover the URL behind any of the URL's created by one of the services listed above. This can be useful if you don't trust the short URL, hiding the real URL. Do you know more services that can make a huge URL short? Place it in the comments and I'll add them to this article.